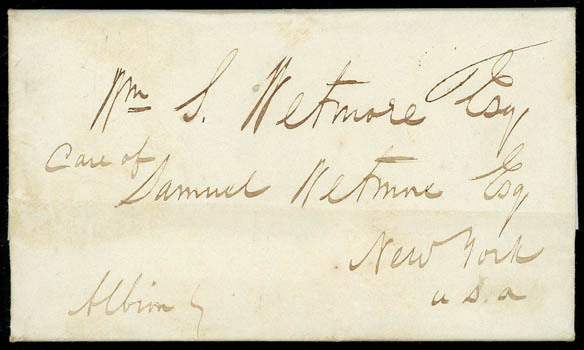 China, 1839 (Nov. 29) Canton, China to New York N.Y., folded letter datelined "Canton November 29th 1839" from Samuel Wetmore to William Wetmore, interesting Opium War content including, "…We enclose a copy of a edict issued by the Commissioner which is very important. We have not time to comment upon it… We are kept in a constant state of uncertainty & doubt - It is impossible to look ahead a day - Changes in this part of the Superintendent & the Commissioner occur so frequently that one knows hardly what to do…on his return he became uneasy inconsequence of the great freights other vessels were making & determined to hazard a trip in the face of accounts expected from the Emperor to the report made to the Battle between the two English Men of War & the Chinese Junks. The account may be expected in a week…", Very Fine. 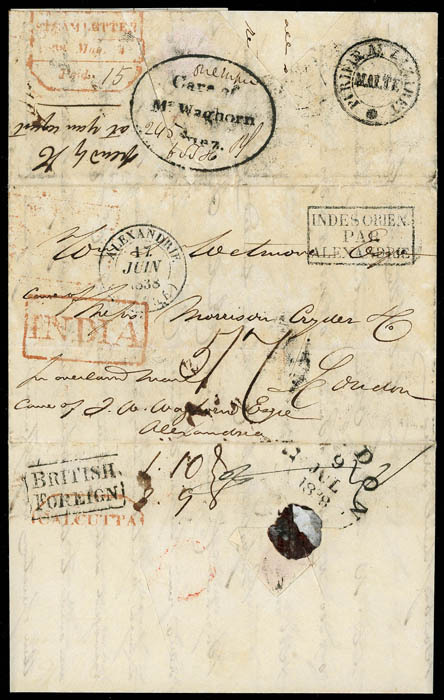 China, 1838 (May 4) Calcutta, India to London, England via Waghorn's Overland Route, folded letter datelined "Calcutta 4 May 1838" to William Wetmore care of Messrs Morrison Cryder & Co. at London, endorsed "per overland mail" and "Care of T.W. Waghorn Esqre., Alexandria" at bottom left, red Calcutta, Steam Letter, 1838 May 4, Paid 15" framed handstamp on reverse and matching "INDIA" framed handstamp, bold "Care of Mr. Waghorn Suez" oval handstamp on flap, Alexandria Egypt (6.17) transit and matching "Indes Orien. Par Alexandria" framed handstamp, two disinfection slits on front and back, "Purifie au Lazaret, Malte" circular handstamp, London (7.9) arrival backstamp, reverse with boxed accountancy "British / Foreign" handstamp with rating breakdown, manuscript "5/7" 5s7d total due rating, Very Fine. A RARE 1838 DISINFECTED LETTER FROM CALCUTTA TO ENGLAND VIA WAGHORN'S OVERLAND ROUTE, WITH OPIUM TRADE NEWS FROM CHINA. Thomas Fletcher Waghorn was a postal pioneer who developed a new route from Great Britain to India, which reduced the journey from 3 months / 16,000 miles via the Cape of Good Hope, to 35-45 days / 6,000 miles overland. He operated with such speed and efficiency that the British Post Office directed mail to his service and his business began to flourish. He set up an agency in Cornhill, London, for conveying post, and passengers, to India via Egypt. Between 1835 and 1837, he lived among Arabs in the desert and laid the foundations for the overland route across the desert from Cairo to Suez. This involved building rest-houses and supplying guides, boats, horses and carriages for travelers. By 1840, the P&O set up in direct competition with him that was backed by the British government, which led to the failure of his overland route. William Wetmore was involved in the China trade including opium. The surviving correspondence was mostly to and from China, but this letter was written by William R. Lejee from India and mentions: "…I left Macao on the 4th March in the Water Witch, with about $93,000 in Dollars & Lycee under my charge, for the purchase of … Opium…I arrived here on the 6th. ulto., sent my dollars and Lycee to the Mint… The sale of opium took place on the 23rd. ulto. ".